Vanessa Paradis is no more single! 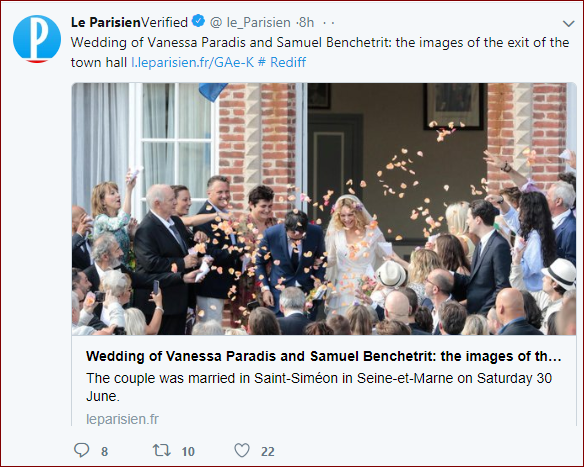 Vanessa Paradis, 45, and film director Samuel Benchetrit wed in an intimate ceremony in Saint-Simeon, France, on Saturday. The couple’s wedding ceremony was attended by two dozen guest, including singer Matthieu Chedid and Vanessa Paradis’ two children, Lily-Rose and Jack Depp, whom she shares with Depp. Paradis and Alice in Wonderland star dated from 1998 to 2012. Vanessa Paradis looked amazing in a cream-colored wedding gown with sheer long sleeves with an embroidered veil. She accessorized her blonde curly locks with pink and purple flowers. Benchetrit dwelled a blue suit on his special day. The two became engaged last November, according to People. Paradis and Benchetrit began dating in 2016 after engaging together on the Chein, French comedy movie. Needless to say, this is Paradis’ first marriage. But, Samuel Benchetrit was previously married to French actress Marie Trintignant from 1998 to 2003. He even shares 20-year-old son Jules with Trintignant. The director also has a daughter, Saul, from his relationship with Anna Mouglalis. Earlier this week, Paradis could not attend the Paris premiere of her latest film, A Knife in the Heart, because of her son’s “serious health problems.” Both Vanessa and Johnny have yet to respond on the reports. However, a source told on Thursday that Jack is doing well.